You may have noticed a hernia as a swelling or lump on your abdomen (tummy). Your abdomen is like a box: your bowel is held in place by the muscles of your abdominal wall. The muscles and their coverings (called fascia) are important for the strength of the abdominal wall. If there is a weakness in the muscles or fascia at any spot, your abdominal wall can protrude out and form a lump or swelling. This swelling is called a hernia. The layers of the abdominal wall form the coverings of the hernia. The space within the hernia can be occupied by bowel or fat from inside your abdomen. The bowel or fat are called the contents of the hernia. Hernias can occur at different places on your abdomen (tummy). The groin – where your abdomen ends and your thighs begin – is a common place for hernias. Groin hernias are of two types: Inguinal Hernia and Femoral Hernia. 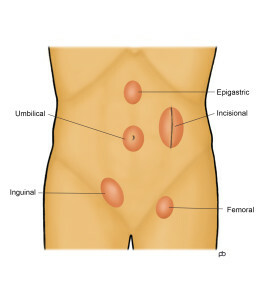 Another spot for hernias is at your belly button, called Umbilical Hernia or Para-Umbilical Hernia. 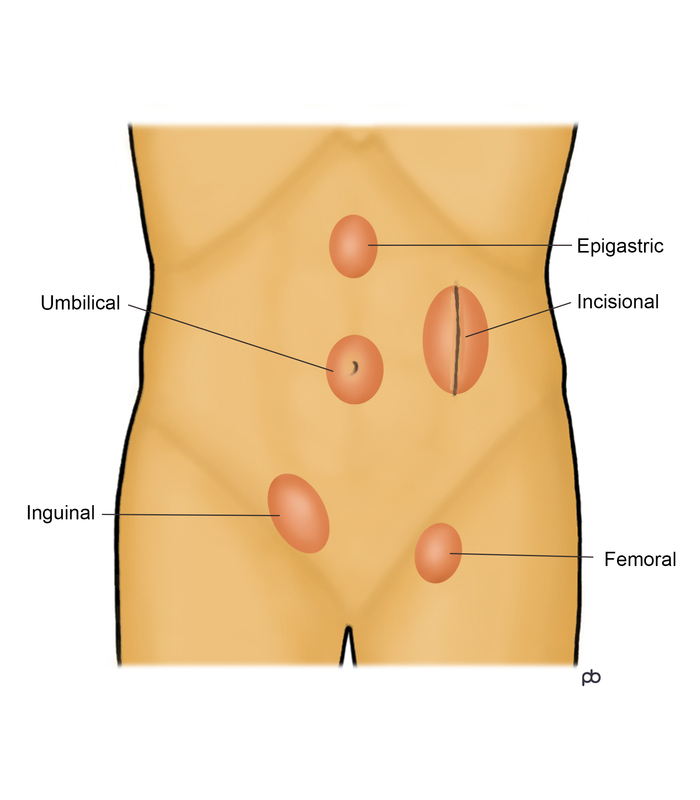 Hernias that occur above your belly button are Epigastric Hernias. A hernia that is away from the centre of your abdomen may be a Spigelian Hernia. A hernia that forms in the scar of a previous operation, anywhere on your abdomen, is called an Incisional Hernia or a Ventral Hernia. A Hiatus Hernia is a special type of hernia. Here, the hernia forms through the diaphragm, which is the muscular partition between your chest and your abdomen. Can a hernia cause problems? The most common symptom of a hernia is pain or discomfort. But, some hernias can be painless. Such hernias are said to be asymptomatic or minimally symptomatic. You may have noticed that the hernia becomes larger whilst standing or coughing, and it gets smaller or disappears when you lie down or press on it. Such change in size is a typical feature of hernias. The hernia is said to be reducible. If the hernia cannot be pushed back in to your abdomen (tummy), it is called irreducible. When a hernia is irreducible, fat or bowel remain trapped within the hernia and cannot return into the abdomen. Irreducibility can lead to complications like bowel blockage and strangulation. Blockage causes cramp-like pain, vomiting, constipation and bloating of the abdomen. The blockage can progress to strangulation, where the blood supply to the bowel gets cut off. Bowel obstruction and strangulation are serious medical emergencies. The risks of obstruction and strangulation are different for different hernias. For some hernias, the risk is very small; for others, it can be quite large. The treatment for a hernia is surgery: an operation to repair (fix) the hernia. But, every hernia does not require an operation. For some hernias, only observation – wait and watch – is sufficient. I have a hernia: Do I need to have an operation? Not all hernias need to be operated. The decision about whether or not to operate requires careful consideration of several factors: What is the type of hernia? What is the size? Is it reducible or irreducible? How is your general health? In some cases, the decision is fairly straightforward. In others, a detailed and thoughtful discussion is necessary. How is hernia surgery done? Hernia surgery can be done either by laparoscopy (keyhole surgery) or by open surgery (a long cut). Laparoscopy is preferable to open surgery in most cases. But, in some cases open surgery may be better. A synthetic patch called a mesh is used to reinforce the muscles of your abdominal (tummy wall) in most hernia repair operations. You could think of a mesh as a specially designed fishing net. The mesh remains in your body permanently. It works like scaffolding so that scar tissue can grow into the mesh and strengthen the area. There are different types of meshes and different ways of fixing the meshes to the muscles of the abdominal wall. There are pros and cons for various techniques, and a thoughtful choice needs to be made. Mr Sarela does both laparoscopic and open hernia surgery, and he will explain the choice that may be best for you.